Inside an inconspicuous Broadway mini-market in Midtown Tuesday afternoon, a story of death, violence and deception was unfolding starring a man known by millions as a serial killer. At least on film. 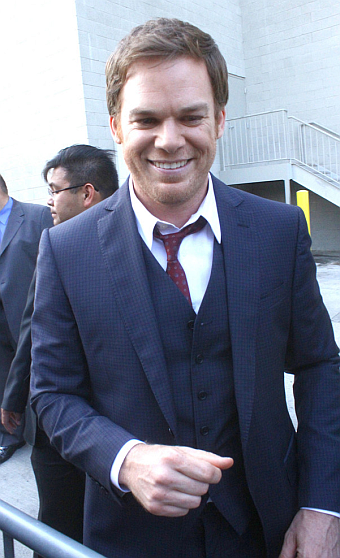 Actor Michael C. Hall, best known for starring as a serial killer in the Showtime series “Dexter,” is shooting scenes in Kingston over the next month as the star of the indie film “Cold in July,” directed by Jim Mickle. It’s the fourth film to be shot in the Hudson Valley in 2013, with one more set to start, said Laurent Rejto of the non-profit Hudson Valley Film Commission. But it’s the first film to be based in and shooting exclusively in Kingston this year. In the film, Hall plays the protagonist Richard Dane, who shoots and kills an armed burglar in his living room. It’s a clear-cut case of self defense to everyone but the burglar’s father, who vows Old Testament-style eye-for-an-eye justice. Here, that means son for son. The cops, the feds, and the Dixie mafia all play a part in the ensuing mayhem.